Lincoln: And so the Children of Israel were driven from the happy land of Canaan. Kaskel: Yes, and that is why we have come to Father Abraham, to ask his protection. In his scholarly study of American Jewry and the Civil War (Philadelphia, 1951), Bertram W. Korn writes that in the eulogy Rabbi Isaac M. Wise delivered after the assassination of President Abraham Lincoln, he claimed: "the lamented Abraham Lincoln believed himself to be bone from our bone and flesh from our flesh. He supposed himself to be a descendant of Hebrew parentage. He said so in my presence." There is no shred of evidence to substantiate Wise's assertion, Korn declares, and "Lincoln is not known to have said anything resembling this to any of his other Jewish acquantances." But, Korn asserts, Lincoln "could not have been any friendlier to individual Jews, or more sympathetic to Jewish causes, if he had stemmed from Jewish ancestry." He also points to the Robert Todd Lincoln Collection of Lincoln Papers in the Manuscript Division of the Library of Congress as a prime source "for the elucidation of Lincoln's contacts with various Jews ... in particular ... Abraham Jonas and Isachar Zacharie." Some of the "elucidation" Korn mentions may be gathered from sixteen items, eight in manuscript and eight in print, garnered from the Library's rich lode of Lincolniana. 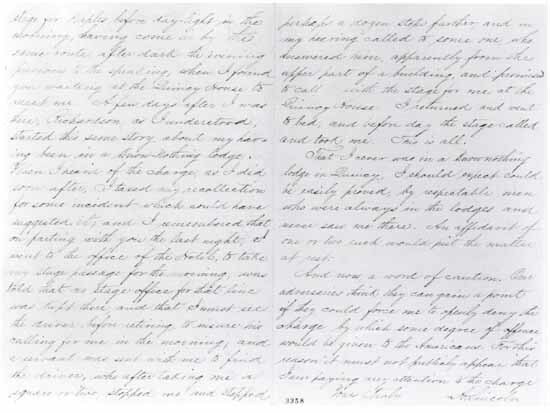 In 1860, Lincoln wrote to Abraham Jonas (1801-1864) "you are one of my most valued friends." The friendship began soon after Jonas settled in Quincy, Illinois, in 1838. He came from Kentucky where he had lived for ten years, served in the State Legislature for four terms, and become the Grand Master of the Kentucky Masons. Before that he lived in Cincinnati; to which he came from England in 1819, to join his brother, Joseph, the first Jewish settler there. In Quincy, Jonas kept store and studied law, which became his lifelong calling. From 1849 to 185 1, he served as postmaster and in 1861 was reappointed to that office by Lincoln. 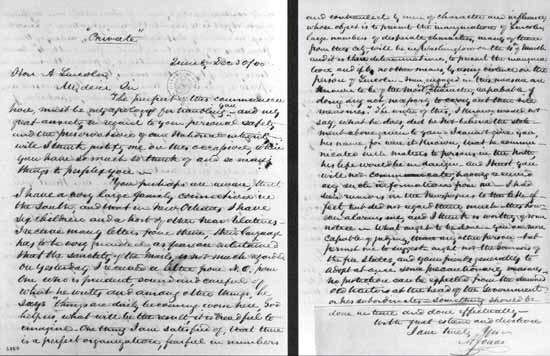 Two letters from the Jonas-Lincoln correspondence in the Library's collection are especially illuminating. That I never was in a Knownothing lodge in Quincy, I should expect could be easily proved, by respectable men who were always in the lodges and never saw me there. An affidavit of one or two such would put the matter at rest. And now, a word of caution. Our adversaries think they can gain a point if they could force me to openly deny the charge, by which some degree of offence would be given to the Americans. For this reason it must not publicly appear that I am paying any attention to the charge. Whatever was done, or not done, by Jonas, must have been effective because the matter was never mentioned publicly during the campaign. This letter marked Confidential discloses the intimate longtime friendship of Lincoln and Abraham Jonas, and Lincoln's political prudence as well as his political stance. Abraham Lincoln to Abraham Jonas, July 21, 1860. Manuscript Division, Papers of Abraham Lincoln. The purport of this communication must be my apology for troubling you-and my great anxiety in regard to your personal safety and the preservation of our National integrity will I think justify me on this occasion, when you have so much to think of and so many things to perplex you. You perhaps are aware, that I have a very large family connection in the South, and that in New Orleans I have six children and a host of other near relatives. I receive many letters from them, their language has to be very guarded, as fears are entertained that the sanctity of the mails, is not much regarded. on yesterday I received a letter from N.O. from one who is prudent, sound and careful of what he writes and among other things, he says "things are daily becoming worse here, God help us, what will be the result, it is dreadful to imagine. One thing I am satisfied of, that there is a perfect organization, fearful in numbers and contrauled by men of character and influence, whose object is to prevent the inauguration of Lincoln, large numbers of desperate characters, many of them from this city, will be in Washington on the 4th of March and it is their determination, to prevent the inauguration, and if by no other means, by using violence on the person of Lincoln. Men, engaged in this measure are known to be of the most violent character, capable of doing any act, necessary to carry out their vile measures." The writer of this, I know, would not say, what he does, did he not believe the statement above given to you. I cannot give you, his name, for were it known, that he communicated such matters to persons in the North, his life would be in danger  and I trust you will not communicate, having received any such information from me. I had seen rumors in the Newspapers to the like effect, but did not regard them much  this however alarms me, and I think is worthy of some notice. What ought to be done-you are more capable of judging, than any other person  but permit me to suggest  ought not the Governors of the free States, and your friends generally to adopt at once some precautionary measure-no protection can be expected from the damned old traitor at the head of the Government or his subordinates-something should be done in time and done effectually. 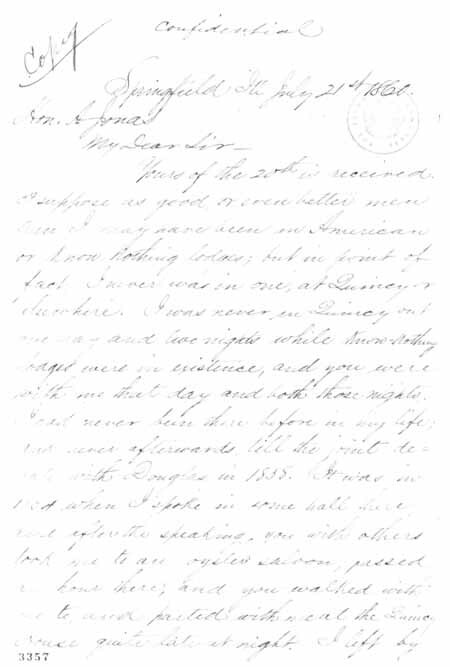 In this prescient letter marked Private Abraham Jonas warns Lincoln that he has been informed by a relative in New Orleans that large numbers of desperate characters...will be in Washington on the 4th of March and it is their determination to prevent the inauguration, and if by no other means, by using violence on the person of Lincoln. Abraham Jonas to Abraham Lincoln, December 30, 1860. Mr. Greeley and one or two others asked who I meant. I said gentlemen I mean Abraham Lincoln of Illinois. I am sorry to say that my suggestion fell flat, it was not even discussed, none of them seemed for Lincoln ... Some one said Lincoln might do for Vice - President-at this point Mr. Jonas ... said: Gentlemen there may be more to Asbury's suggestion than any of us now think. Let us look at England, France, Russia, Holland, aye, almost every nation in the world, and where do we find the Israelite? We find them taken into the confidence of Kings and Emperors. And in this republican and enlightened country, where we know not how soon it may fall to the lot of any man to be elevated to a high position by this government, why may it not fall to the lot of an Israelite as well as any other? I thank you again for the deep interest you have taken in the Union Cause. The personal matter on behalf of your friend which you mentioned shall be fully and fairly considered when presented. Yours of the 19th came duly to hand, it has had the desired effect, with the friend of the Partie. I leave tomorrow for the interior of Pennsylvania, may go as far as Ohio. One thing is to be done, and that is for you to impress on the minds of your friends for them not to be to [o] sure. This brief letter discloses that Isachar Zacharie served Lincoln as more than his chiropodist. It is know from other sources that Lincoln used him on occasion as a private agent, and that Zacharie was deeply involved in trying to secure for Lincoln, the "Jewish Vote." Abraham Lincoln to Isachar Zacharie, September 19, 1864. As rabbi of Congregation B'nai Jeshurun, the Rev. Dr. Morris J. Raphall (1798-1868), one of New York's more prominent clergymen, had gained renown as an orator, distinction as being the first rabbi to open the session of the House of Representatives with a prayer, and notoriety for his sermon The Bible View of Slavery, which was printed, reprinted, and widely distributed as a proslavery sermon by antiabolitionist forces. As Raphall told his congregation, when it assembled to mourn the martyred president, he knew Lincoln but slightly. He had met Lincoln only once, but on that single occasion the rabbi had asked a favor of the president and, as Raphall told his congregants, Lincoln had "granted it lovingly, because he knew the speaker to be a Jew-because he knew him to be a true servant of the Lord." The favor granted must have been the rabbi's request that his son be promoted from second lieutenant to first. Forty years later, in 1903, Adolphus S. Solomons of the book publishing firm of Philip and Solomons, in Washington, D. C., reminisced that he had helped Rabbi Raphall get an audience with the president, where that request was made and granted. Lincoln did even more for Raphall's son-in-law, Captain C. M. Levy. New York's prominent rabbi, author, and orator, Morris J. Raphall, thanks Lincoln for "the generosity and justice with which you have treated my son-in-law Captain C. M. Levy ... You are indeed his true benefactor." Levy, who had been with the Quartermaster Department, and had been distributing special food and clothing to Jewish soldiers in Washington's hospitals, was dismissed from service. 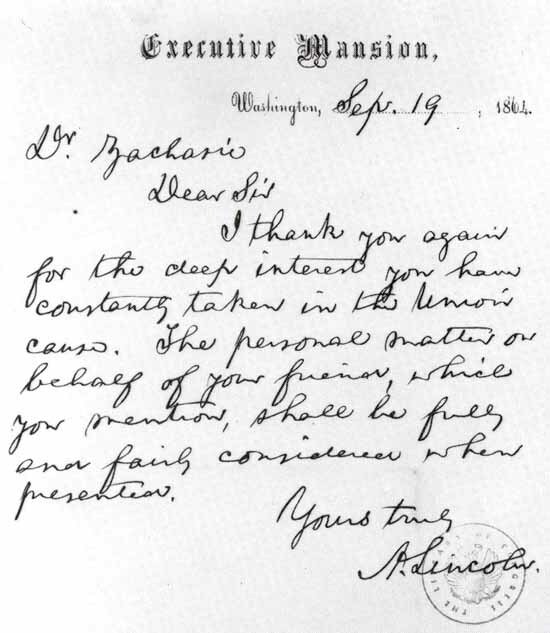 Lincoln's fabled compassion, as this letter of gratitude indicates, apparently came to his rescue. M. J. Raphall to Abraham Lincoln, March 1, 1864. Assigned to the Quartermaster Department in Washington, Captain Levy undertook as an added task to distribute special food and clothing to Jewish soldiers in the capital's hospitals. On October 9, 1863, a Captain C. M. Levy was court-martialed and dismissed from service for unspecified charges. 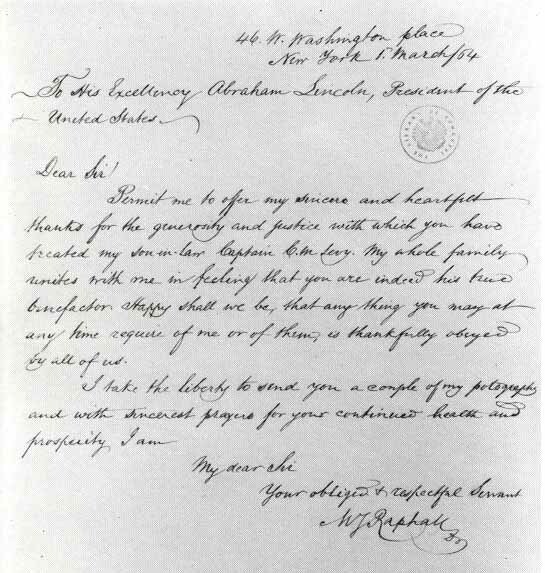 Apparently appealed to, Lincoln must have responded with his fabled compassion, for on March 1, 1864, Raphall wrote him thanking him "for the generosity and justice with which you have treated my son-in-law Captain C. M. Levy." My whole family unites with me in feeling that you are indeed his true benefactor. Happy shall we be that any thing you may at any time require of me or them, is thankfully obeyed by all of us. I take the liberty of sending you a couple of my potographs [sic] and with sincere prayers for your continued health and prosperity I am Your obliged and respectful servant, M. J. Raphall. The "potographs" may well have been the prints of a photograph of the rabbi, first published by P. Haas in New York, 1850, of which the Library has a fine copy.